We’ve arranged a society on science and technology in which nobody understands anything about science and technology, and this combustible mixture of ignorance and power sooner or later is going to blow up in our faces. I mean, who is running the science and technology in a democracy if the people don’t know anything about it? Until U.S. President Donald Trump announced the formation of the Space Force in 2018,1 most Americans were unaware of the existence of the present militarized Space Age, despite more than 50 years of a secret space program cloaked first in the Cold War and then in what is now called geoengineering. The American entry into the race to control space began in 1945 when Operation Paperclip2 brought 10,000 Nazi engineers, technicians, doctors, and scientists to the United States to create technological wonders. For example, aerospace engineer Arthur Rudolph, former colleague of SS aeronautics engineer Wernher von Braun (director of Marshall Space Flight Center), had been Hitler’s director of the Mittelwerk underground rocket factory nicknamed “Dante’s Inferno” where 52,000 prisoners turned out 6,000 V-2 rockets. From 1951 to 1961, Rudolph worked for Martin Marietta3 in Waterton, Colorado, after which he became project director of the Saturn V rocket program. Rudolph became an American citizen and received the Distinguished Service Award. In 1984, he renounced his U.S. citizenship and returned to Germany, having faithfully served the transfer of the Third Reich secret space program to the United States. The Trojan horse of amoral, cryptic Nazism was accompanied by three other horsemen: the National Security Act, the CIA, and the Cold War whose radar installations, rockets, satellites, computers, MK-ULTRA brain engineering, exotic propulsion craft, and wireless technology catapulted 20th century America deep into the 21st century secret space program.4 Obtaining the “final frontier” of space necessitated total command and control (C2) over global airspace, near-earth orbit (NEO), and atmospheric and space weather. While the military researched weather control throughout the Cold War, mainstream media and embedded scientists kept up a litany of dire warnings of a “little ice age,” “greenhouse gases,” and “desertification” that would later morph into “extreme weather,” “global warming,” “climate change,” etc.—all to keep the dollars flowing. 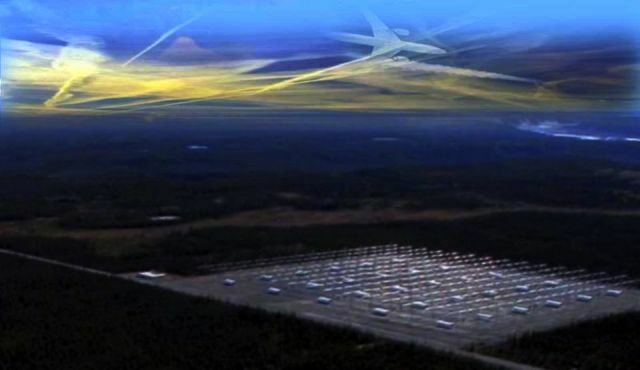 The truth is that ionospheric heaters like HAARP are being used to modify the atmosphere (thus heating it), while carbon taxes and emissions trading support the secret space program. Science has been broken on a rack of secrets owned by the few and denied the majority. Four months after the moratorium, three geoengineered Fukushima earthquakes struck Japan. Having witnessed what had happened to Japan, developing nations at the 2011 UN Climate Change Conference (COP17) in Durban, South Africa attempted to create an International Tribunal of Climate Justice that might serve as a legal bulwark against developed nations wielding weather weapons,19 but by COP21 at the end of 2015, the provision had utterly disappeared. Embedded media continue to layer weather confusion in the public mind, blaming industrial pollutants while assiduously ignoring the role of the secret space program under the American military and defense monopolies like Lockheed Martin and Raytheon. One headline reads that polar glaciers are melting, another that a mini-ice age is inevitable. Solar radiation management (SRM) will one day be necessary; SRM has already begun.20 From the Fifth Assessment Report of the Intergovernmental Panel on Climate Change (IPCC) on, globalist puppet organizations have consistently lied, as investigative journalist James Corbett never tires of pointing out.21 Now and then, scientists like CERN particle physicist Jasper Kirby22 and NASA Goddard Space Flight Center heliophysicist Douglas E. Rowland leak tantalizing tidbits about what is really going on—“There’s different kinds of chemtrails as you probably know”23— but it is tactically ignored. An Italian senator calls for declassification of chemtrail documents,24 a Cyprus agriculture and environment minister pledges to look into “chemtrails” aka aerial spraying25—and then, nothing. And what in the world was going on in 2003, when former Acting Assistant Administrator Henry L. Longest II made midlevel EPA managers read management consultant Margaret Wheatley’s Turning to One Another, urging environmentalists “to abandon Western science in favor of ‘New Science’ . . . the ‘space of not knowing’ and the ‘abyss’. While passing through the abyss, new scientists shed their religious beliefs and sexual inhibitions, then turn to one another,”28 after which managerial candidates had to fill out a confidential questionnaire about their promiscuity, religion, morality, and willingness to keep secrets. What exactly was the EPA up to in the Bush II years? Propaganda, manipulation of international convocations, sharing sexual histories to forge bonds of secrecy, blackmailing nations with the threat of geoengineered weather, perception management of space itself—even “executive actions” (murders)—have plagued the geoengineering frenzy from the beginning. U.S. Representative Dennis Kucinich (Ohio) fought hard for HR2977, the 2001 Space Preservation Act that attempted to salvage the Space Age from bristling directed energy weapons (which included chemical trails). But HR2977 was stalled in committee after committee and eventually killed. On December 19, 2007, Kucinich’s 52-year-old younger brother was found dead; the following year on November 12, his 48-year-old sister died of acute respiratory distress syndrome. Natural deaths, or payback? 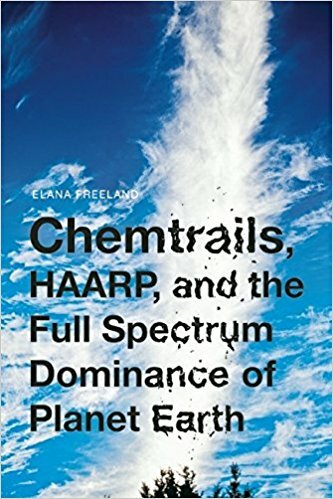 It has been decades of subterfuge, manipulation, and one extreme weather experiment after another in full view of nations whose citizenry were slowly awakening to the fact that weather is no longer an act of God but has been weaponized. Now, it appears that United Nations globalists are satisfied that climate will indeed be the deus ex machina that will bend nations to their will. COP21 in Paris was quite the show, as well. Climate mouthpieces had been carefully chosen—the IPCC, privately funded geoengineers, prestigious universities, embedded NGOs and government agencies, the World Bank and IMF, and of course the usual Wall Street – London deep pockets. Scriptwriters worked overtime on the fate of the Earth as cameras panned in on lightning flashes, rolling storms, deluges and droughts, crying babies, hospital emergency rooms filled to overflowing . . . The carbon lie would rake in boatloads of disaster capitalist cash: $90 trillion in energy infrastructure investments, $1 trillion green bond market, multi-trillion dollar carbon trading market, $391 billion climate finance industry.37 The UN Green Climate Fund alone would clear $100 billion per year, purportedly to support concrete carbons mitigation in developing countries. As to whether or not the money would make it to developing countries after being filtered through multilateral and private banks like World Bank, all bets were off—the naked emperor was not known for keeping his promises . . .
On cue, the Dutch Defence Joint Meteorological Group (JMG) took the lead “in providing weather forecasts for every exercise or deployment of [NATO’s] Very High Readiness Joint Task Force (VJTF),”40 “weather forecasts” referring to the unspoken political blackmail clause that says nations must behave or suffer engineered “acts of God”—floods, droughts, earthquakes, or tornadoes—followed by the enforcement powers of American “disaster relief agencies” (FEMA, USAID, CIA, etc.). Thus we find ourselves wrangling over climate and a long, long way from President Kennedy’s vision of a shared planetary Space Age. The Space Act of 2015 (HR2262) erased the Outer Space Treaty of 1967 so the military-industrial-intelligence phalanx could get on with the business of preparing for capitalism in space, namely asteroid mining and acquisition of lunar helium-3 isotopes. HR2262 may sound like a futuristic fiction or at the most premature, but the truth is that taxpayers know as little about what they’ve been paying for since the Cold War as they do about the UN’s “sustainable development” yoked to the secret space program. The SSS (Space Surveillance System) Space Fence is under the aegis of Lockheed Martin, the number one military contractor corporation in the world. The Space Fence is not just a few radar installations but a vast environmental infrastructure built around and within human society. Manifold, interconnected “dual use” installations provide the command and control43 necessary to full spectrum dominance of weather, near-Earth space, and all organic life. The military goal of turning the Earth’s environment into a chemical / electromagnetic weapon of war has at last succeeded. In 1962, Rachel Carson’s Silent Spring alerted the public to the chemical pesticides allowed to go rogue; in 2001, epidemiologist Rosalie Bertell wrote Planet Earth: The Latest Weapon of War about how thermal and non-thermal radiation, chemical trails, ionospheric heaters like HAARP, engineered extreme weather, etc. were militarizing the environment. How right Dr. Bertell was. From the mid-1990s on, independent scientist Clifford Carnicom dedicated himself to researching what was in the long, sustained trails issuing from jets cruising over northern New Mexico. If they weren’t condensation trails (and they weren’t), what was in them? From precipitation samples and his HEPA air filter, he was able to collect and analyze fibers that had been genetically engineered. Finally, he realized they were the submicron pathogen known as Morgellons.45 Carnicom then collected and analyzed the saliva (the red wine test46) and blood of a few dozen volunteers living in various regions across the United States. All of their samples had the fibers. Slowly, he realized that jet release of Morgellons fibers into the atmosphere must be intentional and planetary. Was the point to incubate the pathogen in the bloodstreams of all lung-breathing organisms? Engineered pathogens were not all that was being delivered by the chemical trails. Conductive metal nanoparticles were rife in both saliva and blood samples. Nano-scale sensors (MEMS, GEMS, and NEMS), “smart dust,” dusty plasma, microprocessors, carbon nanotubes, Fullerenes, buckyballs, nanotopes (isotopes) and tracers are also present. In fact, anything nano-sized that can be remotely triggered to collect data then sent on to Fusion Centers and labs is being breathed in by lungs and loaded by skin.50 Tree bark and leaves, soil, gardens, grazing animals, oceans and rivers . . . Nanotechnology is everywhere. Bionic Man is now loaded with tiny cyborgs (cybernetic organisms) that need only to be remotely triggered to enable augmented bodies, brain-computer interface (BCI), behavior modification (mind control), bio-hacking (“whole brain emulation”), etc. Mainstream media pitch Transhumanism as the bio-neuro “enhancement” religion of the future, but Transhumanism as it stands right now appears to depend upon open chemistry and electromagnetics experiments via tiny cyborgs breathed in and awaiting their remote instructions from the bloodstreams and brains of millions. Futurist Max More, now CEO of Alcor Life Extension Foundation, sagely describes Transhumanism as “a class of philosophies of life that seek the continuation and acceleration of the evolution of intelligent life beyond its currently human form and human limitations by means of science and technology, guided by life-promoting principles and values.” It is phrases like “beyond its currently human form and human limitations” that should concern us. Mark O’Connell, author of To Be A Machine: Adventures Among Cyborgs, Utopians, Hackers, and the Futurists Solving the Modern Problem of Death (Random House, 2017), adds another concern: that Transhumanists are “largely tech people and science people. It’s hugely a white male thing and it tells you a lot about privilege . . . Transhumanism seems to come from a position of privilege.”51 Together, the comments of More and O’Connell point to old Nazi wine in new wineskins. Is a large remotely owned and run Transhumanist slave class under development by corporate techno-slave owners? Space Fence lockdown extends to bodies become CBW test tubes and Petri dishes. A burning Transhumanist question in the future will be: At what point has one abandoned one’s humanity and become a cyborg oneself? Other questions must be asked now without delay, given that millimeter wave iPhones are arriving: Are the thoughts and emotions I’m having my own, or are they from an AI system? Despite all the nanobots I’ve breathed in, eaten, or been vaccinated with, am I still the free will master of my fate? The first deliveries of the engineered nano-entities inside our blood and brains were timed to accompany the proliferation of wireless computers, cell phones, and myriads of transmitting and receiving towers. While the outer environment was being armed, the inner bodily environment was also being armed by aerial deliveries to be followed up with secondary systems like GMO foods and vaccinations. In the end, Space Fence lockdown is about utilizing the environment to either “enhance” or devolve us for Transhumanist agendas. Despite having indigestion from National Security State lies for more than a half century, we the people must continue to educate ourselves regarding our ionized atmosphere loaded with conducting metals. Our conception of it must now add that it is an open-air CBW lab in which we function as Petri dishes and specimen tubes. My third book will plumb the depths of this nano-based Transhumanist synthetic biology. Such is our fate to wrestle with fallen techno-angels. (note by Catherine Austin Fitts: for those who are familiar with Elana’s book or the issues discussed in the article, you will understand how the various topics being referred to in the article are related. For those who are not familiar with either, we would suggest you get Elana’s books because in our opinion there is no civilian researcher we know of, as a “non-insider”, who has studied and documented these issues and their interrelationships more thoroughly). 1 Michael Sheetz, “Pence unveils plan to create Space Force by 2020.” CNBC, 9 August 2018. 2 The Joint Intelligence Objectives Agency (JIOA) circumvented then-President Truman’s anti-Nazi order and scrubbed Nazi affiliations, then granted them new identities and security clearances. 3 In 1995, Martin Marietta merged with Lockheed Corporation to form Lockheed Martin, the number one defense contractor in the world in charge of the Space Fence. 4 See former HUD assistant secretary Catherine Austin Fitts (solari.com) for more about the secret space program (and the missing $21 trillion from the U.S. budget). Go to 25:00 of “Catherine Austin Fitts: Secret Space Force & Deep State Black Budget Revealed: Dark Journalist” (https://www.youtube.com/watch?v=yzc0KXO2DVw, August 3, 2018. Very important. 5 Col. Tamzy J. House et al. “Weather as a Force Multiplier: Owning the Weather in 2025,” August 1996. “2025 is a study designed to comply with a directive from the chief of staff of the Air Force to examine the concepts, capabilities, and technologies the United States will require to remain the dominant air and space force in the future. 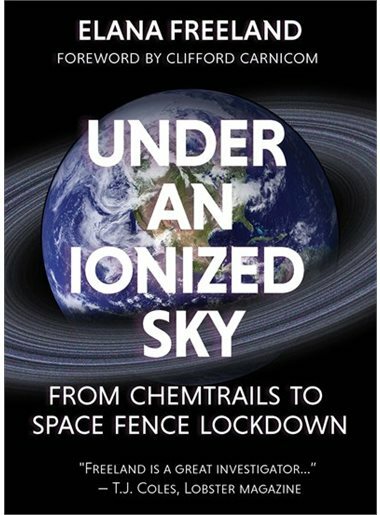 6 These seven operations were first made public by independent scientist Clifford Carnicom; broken down in both Chemtrails, HAARP, and the Full Spectrum Dominance of Planet Earth (Feral House, 2014) and Under An Ionized Sky: From Chemtrails to Space Fence Lockdown (Feral House, 2018). 7 P. Gosselin, “Atmospheric CO2 Concentrations At 400 PPM Are Still Dangerously Low For Life On Earth.” NoTricksZone, 17 May 2013. 8 “Deserts ‘greening’ from rising CO2.” Commonwealth Scientific and Industrial Research Organization (CSIRO), 3 July 2013. 10 Charles Eisenstein, “The Need For Venture Science.” Huntington Post, August 27, 2015. 12 Sean Adl-Tabatabai, “Nearly All Scientific Papers Controlled By Same Six Corporations.” YourNewsWire.com, July 20, 2015. 13 Mark J. Harper, “Dead Scientists and Microbiologists – Master List,” February 5, 2005, http://rense.com/general62/list.htm. 14 Erin Elizabeth, “A Connection with the Holistic Doctor Deaths?” HealthNutNews.com, February 1, 2016. 15 William D. Hartung, “Is Lockheed Martin Shadowing You? How a Giant Weapons Maker Became the New Big Brother.” TomDispatch.com, January 11, 2011. Division, Congressional Research Service, “Chapter 5: Federal Activities in Weather Modification.” Weather Modification: Programs, Problems, Policy, and Potential. U.S. Senate Committee on Commerce, Science, and Transportation, November 15, 1978. 17 The High-frequency Active Auroral Research Project phased array ionospheric heater in Gakona, Alaska used to turn our atmosphere into an ionized antenna. 18 Juliet Eilperin, “Geoengineering sparks international ban, first-ever congressional report.” Washington Post, October 29, 2010. 19 Sarah Malm, “UN planning an ‘international tribunal of climate justice’ which would allow nations to take developed countries to court.” Daily Mail, 2 November 2015. 20 “If SRM were terminated for any reason, there is high confidence that global surface temperatures would rise very rapidly to values consistent with the greenhouse gas forcing.” Rady Ananda, “Solar Radiation Management, Geoengineering and Chemtrails.” Global Research, November 5, 2013. 22 “Chemtrails Confirmed: Climate Scientist Admits Jets Are ‘Dumping Aerosols.’” Chemtrailsplanet.net, January 9, 2015. 23 “NASA Scientist Admits ‘Chemtrails’ Are Real.” Chemtrailsplanet.net, March 11, 2016. 24 Christina Sarich, “Italian Senator Calls for Declassification of Chemtrail Documents.” Naturalsociety.com, April 15, 2014. 25 “Minister pledges probe into chemtrails,” Cyprus-mail.com, February 17, 2016. 26 J.D. Heyes, “NOAA quietly revises website after getting caught in global warming lie, admitting 1936 was hotter than 2012.” Naturalnews.com, July 1, 2014. 27 Daniel Barker, “Nations are now using weather modification as clandestine warfare, CIA warns.” NaturalNews.com, December 19, 2015. 28 David Lewis, “EPA’s disturbing leadership.” The Oconee Enterprise, May 12, 2016. 29 Quoted in Planet Earth: The Latest Weapon of War by Rosalie Bertell (Black Rose, 2001). 30 Stephen J. Crothers, “A Critical Analysis of Ligo’s Recent Detection of Gravitational Waves Caused by Merging Black Holes.” viXra.com, March 8, 2016. 31 See Bob Johnson’s “The Essential Guide to the Electric Universe (EG2EU) at https://www.thunderbolts.info/wp/2011/08/18/10609/. 32 Sarah Kaplan, “Scientists claimed they found elusive ‘Planet X.’ Doubting astronomers are in an uproar.” Washington Post, December 11, 2015. 33 Alan Levin, “NTSB: Ted Stevens’ plane crash remains a mystery.” USA Today, May 24, 2011. 34 Ari Phillips, “Canadian Government Dismantles Ecological Libraries After Dismissing Thousands of Scientists.” Climate Progress, January 10, 2014. 36 Liz Ford, “Global goals received with rapture in New York – now comes the hard part.” The Guardian, 25 September 2015. 37 James Corbett, “And Now For The 100 Trillion Dollar Bankster Climate Swindle . . .” The Corbett Report, February 24, 2016. 38 Jacob Levich, “The Real Agenda of the Gates Foundation.” Aspects of India’s Economy, No. 57, May 2014. 39 Hitler’s propaganda minister Goebbels would have been green with envy over the success of this one lie. 40 “The Netherlands takes over meteorology for the NATO Response Force.” SHAPE (Supreme Headquarters Allied Powers Europe) press release, 13 January 2016. 41 Patrick Wood, “NAU Reborn As ‘North American Climate, Clean Energy and Environment Partnership’.” Technocracy News, June 30, 2016. 42 See Nikolai Kardashev’s three phases of technological achievement for civilizations aspiring to a Space Age: (1) Full spectrum dominance planetary control; (2) control over one’s star and its systems; (3) control over one’s galaxy and its systems. 43 Military command and control (C2) is actually C4 today: command, control, communications, and cyberwarfare. 44 See Professor Claudia von Werlhof’s article “Earth as Weapon, Geo-engineering as War,” Global Research, November 28, 2017. 45 Generally wrongly diagnosed as either an “unconfirmed” skin condition or psychological condition (delusional parasitosis). 47 Paul Harris, “They’re called the Good Club – and they want to save the world.” The Guardian, 30 May 2009. 48 William J. Broad, “Billionaires With Big Ideas Are Privatizing American Science.” New York Times, March 15, 2014. 50 Sounding rockets, GMO foods, and vaccinations also appear to be delivery systems. 51 Angela Chen, “’They want to be literally machines’: Writer Mark O’Connell on the rise of transhumanists.” The Verge, February 25, 2017.